A nudge over the two hour mark, Bring Me The Head is, like its predecessors, composed entirely of vast sprawling atmospheric compositions in between which slightly more concise pieces are inserted. Although it is quite difficult to determine the exact composition of any of these pieces, processed guitars form the bulk of Dunn’s sonic palette, stretched into long, fluid drones arranged into oddly melodic compositions, but it sometimes takes some time to get these, so broad are his soundscapes. There is, in essence, very little distinction between any of these compositions; Dunn doesn’t only generates slow moving drones, but, while all these pieces are stand-alone, clearly separated from each other, his distinctive sound spreads over the whole record, as if it was contained within a cocoon and appeared almost entirely uniform from the outside. The devil, as is often the case, is in the detail; here an unusual chord progression or recurring loops imperceptibly derailed by an unexpected step in a series of patterns, there a slight tonal difference or a slowly morphing drone… These are often perceived rather than heard clearly, like elements of a dream which may or may not actually have a reasoned place as part of it, yet alter it somehow. 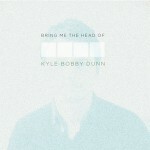 Taken as a whole, Bring Me The Head Of Kyle Bobby Dunn can feel a tad intimidating, but the two CDs actually work perfectly well as standalone recordings, giving the freedom to experience the work either in all its glory or in more manageable chunks to fit the listener’s mood. Kyle Bobby Dunn ultimately creates here another impressive record and sees him assert his place at the more atmospheric end of the music scene.